Old-school fans playing Final Fantasy VII: *squealing brakes* Hold everything! When does Final Fantasy start? I bought a frickin’ Final Fantasy game, and you’re foisting SF on me? Where the heck is this coming from? What does this have to do with Final Fantasy!? Mythology major: Gee, I’m glad you asked that question. Final Fantasy II bucked the trend, although the final prep-before-endgame quest was to reach the Four Elemental Crystals (orbs) — Earth, Wind, Air and Fire — that bestowed the Ultima spell. 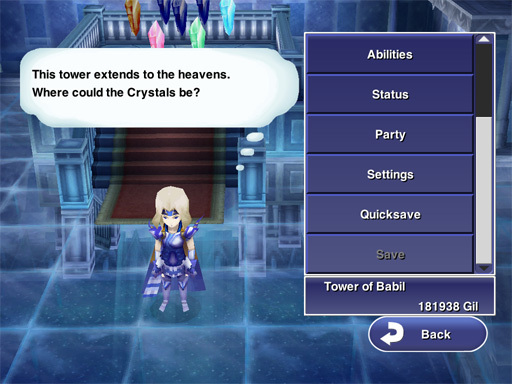 (Final Fantasy III, again with retro graphics dressing up the original game). 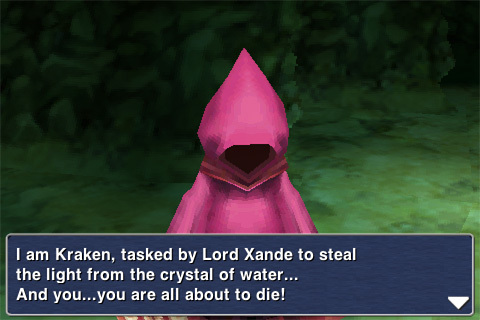 Yep, in FFIII, nasty villains are again tapping the elemental forces of the world, stored and nurtured by the Four Crystals of Light, for nefarious purposes. 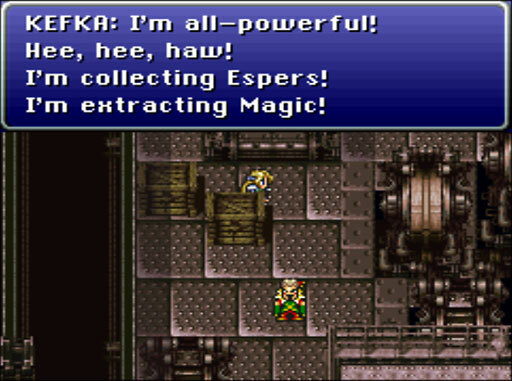 The twist in FFIV is that Cecil starts out as a villain himself, collecting the Crystals. And Final Fantasy V? 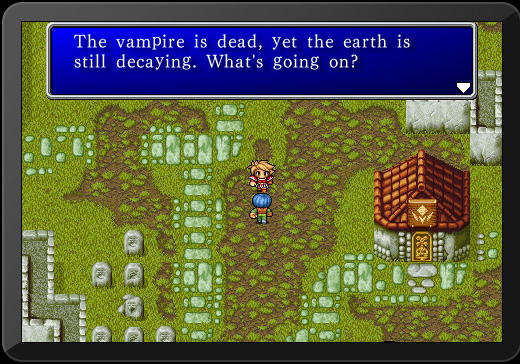 We’re back to the plot of FFI and FFIII. Someone’s tapping the Four Crystals of Light for power. Only this time, it’s the good guys doing it, using machines built by the well-intentioned genius Cid. 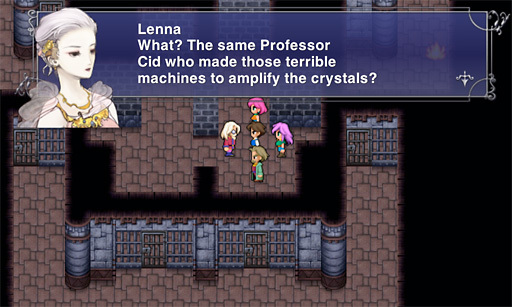 Cid doesn’t realize until too late that his machines are damaging the crystals and sucking their elemental energies from the world. The world nearly dies as the powers of Earth, Air, Water and Wind are drained from it. 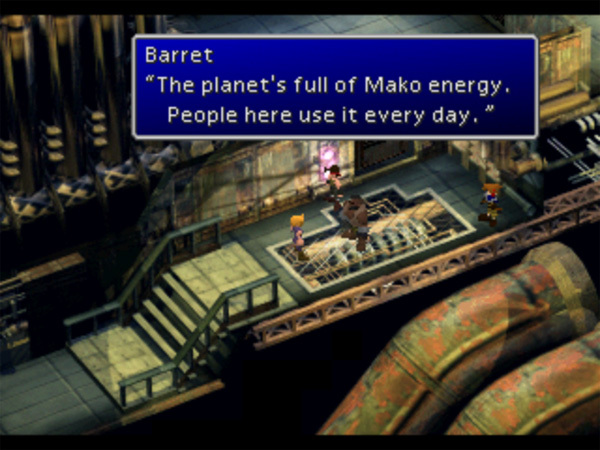 …and of course he’s doing it by using the Magitek Research Facility that distills the powers of Espers (summoned creatures, personifications of elemental powers like Earth, Air, Fire and Water) down into Magicite crystals, which are then drained for their magic. Nope. Final Fantasy VII is a total break with the past. It has no right to call itself Final Fantasy! …because while it may be the same old plot, it’s doing it in the key of SF, instead of F! 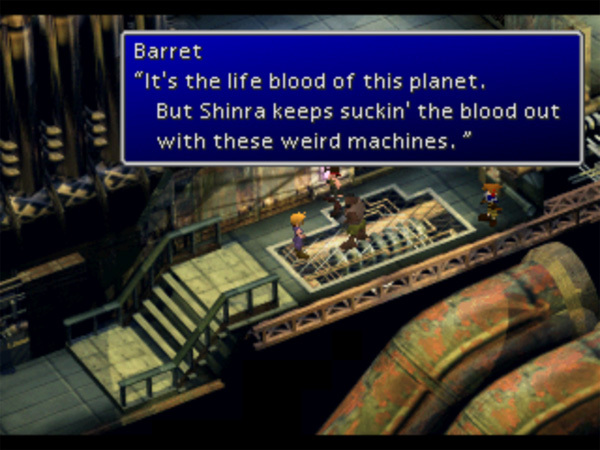 This entry was posted in Final Fantasy VII, meta and tagged crystal, ffvii, light and darkness. Bookmark the permalink.